Easy WebCam Recording is an easy to use application designed to enable you to record new files with your webcam. The recording can be launched by direct click or by motion detection and the recorded files are saved on a local hard disk and can be transfered automatically to an FTP server. Easy WebCam Recording generates a list of jpeg file according to the activity in front of the webcam with the setting of sampling time. When the applications starts, normal or minimized mode, it can record nothing untill you click a recording button, it can start recording immediatly or it can start recording after motion detection as well. 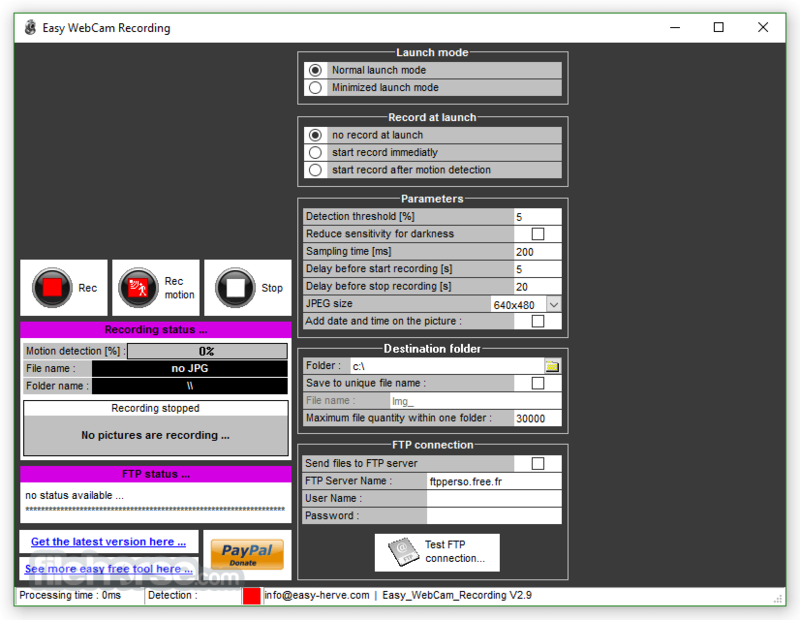 The Easy Webcam Recording software gives the possibility to send all the recorded files to an FTP server in REAL TIME. All the generated JPEG files are saved under this specified folder. Then, the application creates automatically sub folder named like a fixed prefix (SUROR) plus the date of the day. Moreover, when the motion detection is enabled, the application creates other sub folders (named like D0000, D0001, ...) each time a new motion is detected.